Learning disabilities are defined as conditions that give rise to difficulties in acquiring knowledge and skills, such as Autism Spectrum Disorder, Down’s Syndrome, and Attention Deficit Hyperactivity Disorder (ADHD). Learning disabilities are often neurologically-based, but other conditions, such as physical disabilities, can also limit a person’s ability to learn in the traditional fashion. No matter what the case, as a person with disabilities you have rights and the freedom to pursue higher education. If you’re curious to learn more about learning disabilities, or to see if you qualify as a student with disabilities, scroll to the bottom of the page to find more information regarding specific conditions, diagnosis, and related resources. According to research conducted by the National Center for Education Statistics (NCES), the percentage of students in postsecondary school (also known as university or college) that noted having a disability was 11 percent during the school years of both 2007-2008 and 2011-2012. Additionally, during the 2011-2012 school year, about 5 percent of students attending post-baccalaureate (post-graduate) education reported having a disability. The NCES classified students with disabilities as anyone who reported that they had one or more of the following conditions: a specific learning disability, a visual impairment, hard of hearing, deafness, a speech impairment, an orthopedic impairment, or a health impairment. As for graduation rates, the Bureau of Labor Statistics (BLS) states that in 2014, about 16.4 percent of those over the age of 25 and reporting having a disability achieved graduation with at least a bachelor’s degree. In that same year, 25.5 percent of respondents over the age of 25 reported having a disability and achieving some college or an associate’s degree (2 year degree). As also noted in the BLS report, those that had completed some college had a greater chance of attaining a job post-graduation. Colleges and Universities: These forms of postsecondary education offer a plethora of degree options — from four year degrees all the way to masters and doctorates. The initial undergraduate education (a typical four year degree path) can help prepare students for further higher education opportunities if they are interested in achieving the highest level of specialization in their field. Many colleges and universities now offer online programs as well, which can be especially useful for students with disabilities who face physical accessibility challenges. Maryville University offers online Bachelor’s degree programs, online Master’s degree programs, and online Doctorate level programs for prospective students. Community or Junior Colleges: These forms of postsecondary education offer two year degrees that are designed to prepare students for further higher education. Typically students attend community or junior college to prepare for traditional college or university, learn essential job skills, or to take college level classes that may cost less than a typical public university. Students can achieve an associate’s degree with many community or junior colleges. Vocational or Technical Colleges: These forms of postsecondary education are specifically formed to teach essential skills to students interested in a skilled trade. This can be anything from mechanics and welding, to art and graphic design. They are meant for technical and specialized careers, and many students can begin apprenticeships with a skilled tradesperson through these programs after receiving the appropriate certification. Cost and time spent in the program are both dependent on the chosen career path, but typically ends with the student receiving a technical certification. Transitional Education Programs: These postsecondary education programs are meant to help students transition after high school and continue their studies. They can also learn essential skills and be better prepared to transition into a career after high school. Many transitional schools focus on particular needs — such as specialized learning environments for students with autism or students with impaired vision — and some even partner with local universities to offer introductory classes or community space. Independent Living Services: These programs — although not education based — can still help students with disabilities better prepare to live on their own and learn essential skills. They are specially targeted for youth (age 15-21) and are often funded by state-run departments. They can also offer additional services, such as counseling or financial assistance, for students that need further support. Contact your local state government agency (often the state Department of Health, though some states have agencies dedicated to disability assistance) to find out more about their independent living services. Transitioning from high school to college can be a major life change for anyone, but especially so for students with disabilities. This is why it can be so beneficial to start preparing for independence and higher education while still attending high school. Prepare for entrance exams: The SAT and ACT are two very common, commercially available tests for students that are interested in pursuing higher education. Most students take this test sometime during their final two high school years, and students can also take supplementary tutoring to help them prepare. Both tests offer what is known as “testing accommodations” for students with disabilities that are interested in taking the exam. The accommodations must never fundamentally alter the exam. Students that are interested in taking this test but need to request conditions must first contact the institution or postsecondary entity that administers the exam and provide documentation of a disability and the need for a change in test conditions. The accommodations often range from braille or large print text, to extended test times and small groups or private rooms — but never fundamentally alter the exam in its entirety. Apply to colleges: The application process for students with disabilities is almost identical to a traditional application process. Students with disabilities are not required to disclose their disability unless they are interested in pursuing disability-related services with the school. Disclosing a disability is always voluntary. Additionally, colleges and universities are prohibited from denying acceptance based on disability to students who meet the essential requirements for admission (such as GPA, extracurricular activities, and more). If you are interested in requesting accessible housing or an academic adjustment, you may be required to provide some form of documentation to the school. Research your future college institution: Each school has their own unique requirements for documentation of a disability, and students with disabilities should research documentation standards for the colleges that interest them. The primary purpose of this documentation will be to establish a disability and the need for academic assistance so that the university or college can work interactively with the student to identify appropriate services. Researching your future postsecondary school will help you understand the options available for academic adjustment or other services afforded to students with disabilities. Additionally, you can identify the layout of campus, or where specific offices may be location. Apply for Financial Aid and Scholarships: Just like any other student, you will need to be able to afford the postsecondary school of your choice. Oftentimes this may result in financial aid, but there are plenty of scholarships available for students with disabilities, as well (scroll to the bottom for a list of some options associated with each condition). Check with the admission office for your school of choice to see what requirements there are and what the cost of tuition might be. If you need to apply for scholarships or financial aid, the best time to do so would be while you’re applying to colleges (typically a semester or 8 months before you plan to start). Prepare for changes: College is both an exciting time and a major life change. For many students, you may be moving out of your childhood home and living on your own for the first time. No matter what your situation may be, this new chapter in your life will require some adjustments. As you prepare, be sure to also keep in mind your emotional health, and how you will cope with the added stress and newfound freedom you may be experiencing. To find out more about the importance of emotional health and creating a support system, visit Transitional Year (Student) or Transitional Year (Parent) for some helpful resources and articles. To help students better prepare for their first year in college, many postsecondary schools and associated groups offer transition programs for prospective students. You will need to research your options early, and apply for these programs in advance (at least 6 months prior to the start of the session). Do you want to get a head start in a particular career field? Do you want to earn college credits? Do you want to learn more about your field/major of interest? Do you want to develop skills to help you succeed in college? Do you want to bolster your resume? Do you want to try out a particular school before you enroll? All of these questions should help you better prepare for the right transitional experience. Keep in mind that transitional services are meant to offer one of the following: academic enrichment, information sharing, mentoring, or social enrichment. Internships: Internships are intended to expand classroom learning to a full or part-time supervised and work-based setting. To find out more about how to maximize your experience in an internship, read this pamphlet created by the National Consortium on Leadership and Disability for Youth (NCLD Youth). Work-based Learning (with IEP): Work-based learning programs can be provided by high schools during the school year by partnering with local businesses, but must be included in an Individualized Education Program (IEP) and meet the standards set by the Department of Labor. These programs may be paid or unpaid. The business will be required to sign a written agreement, and students can learn essential job skills throughout the school year. Summer Work Experience Programs: These programs are designed for students that wish to learn essential job skills over their summer break. Your local Workforce Investment Board (WIB) can help find summer employment opportunities in your area that are typically basic entry-level jobs. Eligibility in these programs is based on income, but students with disabilities are considered a “family of one,” meaning family income will not be considered for eligibility. If you’re interested in a summer program, contact your guidance counselor for recommendations, or search for your local WIB office here. Volunteering: Volunteering with local charities or nonprofits is an excellent way for students to learn essential skills, expand their resume, as well as help out in their local community. Volunteer opportunities are typically unpaid, are not tied to an educational program (unlike internships), and both students and their parents can benefit from these programs. Your local United Way chapter will most likely have a large database of local volunteering opportunities, but you can also ask around with family and friends to see if they know of any local charities looking for volunteers. Volunteer positions can often be catered to specific needs, and the purpose is to find a volunteer opportunity that interests you or coincides with your personal goals. If you would like more information on volunteering, why it’s important, or any advice on the matter, read more about it at ServiceLeader.org. Pre-College Programs: If you are interested in attending a college, but unsure if it is the right fit for you, many colleges offer up pre-college opportunities. These are normally summer programs that allow students the opportunity to live on campus, earn college credits, and prepare for their future as a student. Each college offers their own unique programs, so check with the school you’re interested in to find out more. Be aware that some programs might not be covered by financial aid or scholarships. Community College Courses: If you’re interested in experiencing college-level courses, your local community college may be able to offer single classes that can help you earn credits at a fraction of the cost of typical universities. Additionally, these summer classes can help you get a taste of the college experience to see if it’s right for you. There are many freshman-level “college success strategy” courses that can help you better prepare for postsecondary education. Be sure to check if there are any placement requirements (such as entrance exams or GPA requirements) and provide any necessary documentation you may need to request academic accommodations. The protections that are extended to students with disability are established in Section 504 of the Rehabilitation Act and Title II of the Americans with Disabilities Act (ADA). Postsecondary education institutions are subject to the same federal rules and guidelines as high school, but have some unique differences. For example, K-12 schools are required to offer free appropriate public education (FAPE) to all students. However, postsecondary schools are not required to offer FAPE, but are required to offer academic adjustments as necessary to ensure that it does not discriminate on the basis of disability. Additionally, postsecondary schools are not required to identify your disability, but instead that responsibility is left to the student to provide documentation of their condition if they need auxiliary services or academic adjustments. However, if the institutions offers housing to students, it must also offer housing for students with disabilities that are accessible, comparable, convenient, and at no extra charge to the student. The purpose of any auxiliary services that a school may offer is to ensure equal educational opportunity to all students. However, your school must first be notified of your disability so they can use that information to provide you with the best possible solutions. Disclosing a disability is always voluntary, but if you decide to do so you may be required to provide certain documentation to the school (each school varies in what they may need, so check with them before proceeding). Once you’ve notified your postsecondary school of choice of your needs, you can request academic adjustments that may be required for you to attend class, take tests, or otherwise access educational services. The U.S. Department of Education offers a helpful pamphlet for students with disabilities and their parents to understand their full legal rights as a postsecondary student. Learning disabilities are defined as any condition giving rise to difficulties in acquiring knowledge and skills to the level expected of those of the same age, especially when not associated with a physical condition. Physical accessibility challenges and chronic conditions might also qualify for assistance with postsecondary schools, as well. Some of the most common learning disabilities are listed below, as well as their definition, diagnosis, symptoms, and available resources for people that are experiencing that disability. Consult a doctor to discuss diagnosis if you feel any of these conditions apply to you. ADD and ADHD are both classified as chronic neurodevelopmental disorders that can manifest in repetitive behaviors, lack of attention, impulsivity, and hyperactivity. Diagnosis of this condition is normally conducted by a behavioral therapist, occupational therapist, or clinical psychologist. There are some prescribable medications for these conditions, but early identification and treatment is vital to helping persons with ADD or ADHD succeed. Most people with ADD or ADHD are diagnosed and treated at a young age, but some can make it into adulthood without ever realizing they suffer from these conditions. This is especially true for women, as young girls often manifest different symptoms than young boys, which might go unnoticed by some doctors. If you are interested in pursuing postsecondary education, here is a list of some scholarships that could help you pay for college. In learning environments, students with ADD or ADHD might find it extremely difficult to pay attention to work, or to remain on task. Although many students may have found ways to navigate their condition in high school, the transition to college can be extra stressful. The added independence of living on your own, as well as the increased expectations, workload, and influx of new people can quickly overwhelm you. Audible: This service requires a small monthly fee, but provides access to thousands of online audio books, audio texts, and radio programs. You can play them on your smartphone, tablet, or computer. Classmate Reader: This device reads digital files and books, as well as offering other study tools. Co:Writer: This application is designed to help students improve their grammar, punctuation, and spelling skills. Focus Gps: This app is specifically designed to help students with ADHD boost their academic performance by assisting in areas of memory, concentration, and organization. GoQ: This software provides advanced word prediction, which can help students who find it difficult to type long pieces. Livescribe Pen: This standard ballpoint pen also uses Bluetooth technology to send everything the student writes to a smartphone or tablet. OnlineOCR: This product converts scanned PDFs into editable formats, which can be useful for students who like to take notes on their reading assignments. Talking calculator: There are many talking calculator options, downloadable apps apps for your smartphone, that help students hone their concentration by saying numbers and answers aloud. Autism is considered a learning disability due to its characteristic of social-interaction difficulties. Students with autism may find it difficult to pay attention during class, answer questions, or make eye-contact and communicate with teachers and fellow classmates. Autism spectrum disorder (as the name implies) varies on a spectrum from person to person. The effects of the condition could be very mild to very severe, but diagnosis should be confirmed by a doctor that specializes in behavioral therapy or neurology. Autism can be genetic, as well, so some doctors may recommend a patient visit a neurologist for further testing. Research is continually being conducted on this condition, and new findings are being discovered every year. Autism Speaks: This organization offers a list of postsecondary schools, scholarships, and workshops to help you prepare for your future as a college student. Autism Now: This advocacy group also offers a list of resources for students with autism that are interested in attending higher education. Appy Autism: although not app based, this database can help you find apps that best meet your needs. Simply follow the guide to populate a list of apps and explore your options. Audio Notetaker: There are a few options for students that would rather take notes through audio, rather than typing them out. Audio Notetaker and Dragon Dictation both offer these services. AutiPlan: This scheduler uses pictures instead of words to help visual learners better plan out their daily, weekly, or monthly schedules. Tobii C8: This technology allows students who need assistance communicating verbally to use text and symbols to generate speech. 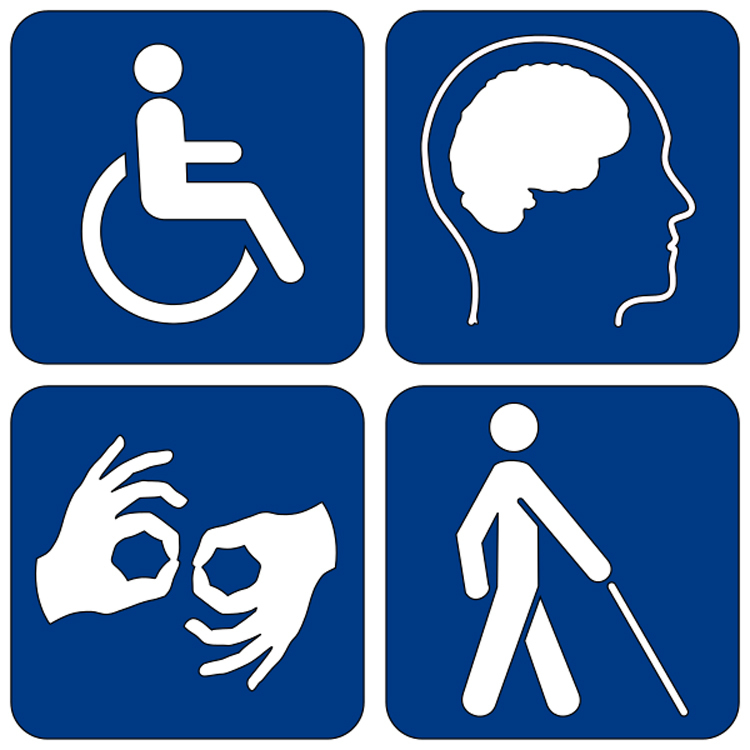 Cognitive disabilities cover a range of different conditions related to the mind. Some common conditions include: Autism Spectrum Disorder, memory loss, Parkinson’s Disease, Down’s Syndrome, and loss of cognitive abilities due to brain injury. Students with cognitive disabilities may find it difficult to attend postsecondary education, but technology has really helped increase the accessibility of college courses to these students. There are even specialized programs offered at different universities across the nation that were structured with the needs of students with cognitive disabilities in mind. The Institute for Community Inclusion has created a comprehensive list for students with intellectual disabilities that are interested in options for postsecondary education. FinAid.org offers a list of financial aid and scholarship options. Collegescholarships.org has a small list of scholarships that included deadlines and amounts. Endeavor Desktop Environment: Creates a customizable desktop for students with a simplified picture and audio system. First Then Visual Scheduler: Helps students manage their calendar with images instead of words. Touchscreen Monitor: These computer monitors are perfect for students who prefer to use their finger or a stylus to navigate websites rather than a mouse or trackpad. There are also a plethora of laptops available with similar technology. Visual Impact Pro: This application provides clear, step-by-step instructions for daily tasks to help students who are recently independent learn many important skills. Hearing impairment effects about 15 percent of Americans over the age of 18, according to the National Institute on Deafness and Other Communication Disorders. Although it may feel daunting to attend postsecondary school lectures when suffering from a hearing impairment, technology has helped make the classroom considerably more accessible in recent years. As mentioned, accessibility for students that suffer from a hearing impairment has improved considerably over the years. Hear Now: This creation of the Starkey Hearing Foundation offers low-cost or free hearing aids to people that have a limited income. AudioNote: This notepad is paired with voice recording technology so it can turn audio notes into text. ListenTech: This company provides a variety of assistive listening devices for students seeking to improve their hearing abilities. MovieCaptioner: This technology can easily add captions to any audio-visual media. MyVoice: This augmented communication aid helps students communicate through a device. Sign4Me: This smartphone application teaches American Sign Language via 3D images and video. 4AlarmClocks: This application provides special alarm clocks for students with a hearing impairment to help them ensure they don’t miss classes. Learning disabilities are defined as conditions that limit or interfere with skills such as reading, writing, understanding directions, or math. These conditions are typically neurologically-based, and some examples include: dyslexia, dysgraphia, dyspraxia, dyscalculia, and audio processing disorder. Diagnosis of these conditions should be done by a clinical psychologist, a developmental psychologist, an occupational therapist, or a speech and language therapist (depending on the condition being addressed). Scholarships.com has a small list of scholarships that included deadlines and amounts. Breathe2Relax: This tool is intended for portable stress management, which helps students calm and center themselves when they feel overwhelmed. Brevity: This app helps with word completions, which is intended for students who may have difficulty typing. ClaroRead: This dyslexia support software breaks down words phonetically to help make reading and writing easier. MyScript Calculator: This application allows users to write and calculate equations without pushing buttons. Say It & Mail It Pro: This app allows students to record and email voice memos from smartphones and tablets. Symbaloo: For computers, this app provides icon based social bookmarks rather than words. Physical disabilities are conditions that limit a person’s ability to walk or get around without assistance. Diagnosing physical conditions is fairly easy, and many businesses, public spaces, and institutions have been redesigned with the needs of people with physical disabilities in mind. This includes compatibility with ADA requirements, such as ramps, wheelchair accessible spaces, and accessible parking spaces. Postsecondary education institutions should also comply with ADA requirements to help make spaces accessible to all students. 101 Mobility created a list of some of the most wheelchair accessible campuses in America. There are many online chat rooms and discussion boards available for students with physical disabilities, including Disabilities-R-Us and Reddit. Dragon Voice Recognition: For students with accessibility issues, this application allows students the ability to complete online work with their voice by translating it to text. FrogPad: This device provides a single-handed touch-typing keyboard. Keyguards: Keyguards sit on top of keyboards, making it easier to type the intended keys, with less mistakes. Mounting Systems: There are plenty of these devices that allows students to mount their technology or other study devices to specific places. PageFlip: For students with limited fine motor skills, this device provides hands-free page turning for books, magazines, and other physical reading materials. Rock Switch-adapted Joystick: This device provides an excellent alternative for students who seek minimal hand movement while computing. Psychiatric disabilities can come in many different forms, including: bipolar disorder, generalized anxiety disorder, post-traumatic stress disorder (PTSD), severe depression, and obsessive compulsive disorder (OCD). Generally, these conditions are categorized by excessive feelings of fear, depression, or compulsion; enough so that it might directly interfere with your life and prevent you from participating in everyday activities. Psychiatric disabilities can vary in severity, but are often considered “invisible conditions,” meaning these conditions can have a profound effect on your life but might not manifest with any physical symptoms or outward signs. Diagnosis of these conditions should be left to a clinical psychologist, behavioral therapist, or other behavioral specialist. There are treatment options for many of these conditions — normally through the form of prescription medications coupled with counseling or therapy — and they can affect anyone throughout their lifetime. For students with psychiatric disabilities, it can be difficult to adjust to the large changes that you will experience leaving high school. It can be easy to become overwhelmed when you start postsecondary education, however there are plenty of resources available to help you adjust and afford college. A list of 5 scholarships aimed at students that struggle with mental illness. Another list of 8 scholarships aimed at students that struggle with mental illness. As for assistive tools, there are plenty available that can help with managing stress, take notes, or adjust to independent life on campus. Additionally, consider your options for online education. Many online classes can adjust to a schedule that works best for you, and you can take many of these courses from the comfort of your home. Breathe2Relax: This tool is intended for portable stress management, which may help students calm and center themselves when they feel overwhelmed. PTSD Coach: This app was created specifically for veterans that suffer from PTSD, and can help educate users about conditions, offer self-assessments, and link to support groups. It can also provide stress management tools. Mindshift: This app is aimed at students and teenagers with anxiety to help them better adapt to social situations or school life. It provides journaling tools, positive thinking exercises, and symptom trackers. Speech and language impairments are common conditions that can vary in severity. Some examples of these conditions include: apraxia, dysarthria, stuttering, and aphasia. Diagnosis or treatment is normally done by a speech pathologist, and these conditions typically develop at an early age. To find out more about identifying speech and language impairment, The Medscape Journal of Medicine featured an in-depth article on the topic in their 2008 June edition. Although not strictly limiting a person’s ability to learn, speech and language impairment may require students to request specific accommodations from their school in order to access educational courses or take exams. Some common accommodations include speech aids (such as wands, electronic speaking machines, or spelling boards), or modifications made to exams or presentations. CoolSpeech: This application converts digital text into spoken text that can be imported to most computers. MyTalkTools: This app allows users to communicate through a variety of mediums including text, images, symbols, and audio files. ProLoQuo2Go: This mobile application is highly regarded and offers assistive communication for users. Speech Trainer 3D: This application (via the iTunes store) helps students practice sounds to improve speech delivery. Talking Dictionary: This online resource can help students find the correct pronunciation for any word, as well as its use and meaning. TextSpeak: This talking keyboard can convert typed words instantly into speech. Visual impairments often affect people over the age of 50, but about 7 percent of reported cases affect those between the ages of 15-44. Many visual impairments can be treated or cured, but diagnosis should always be done by a qualified physician or optometrist (eye doctor). Types of visual impairment include: cataracts, glaucoma, blindness, mild to moderate or severe vision loss, and more. Although visual impairments might not strictly limit a person’s ability to learn, students will often require special accommodations to make education more accessible for them. The American Foundation for the Blind (AFB) has constructed a helpful guide for future postsecondary students that covers accommodations, application deadlines, and commonly asked questions. The AFB also offers a scholarship for students with a visual impairment or blindness, and you can find a small list of similar scholarships for students with visual impairment here. Cicero: This application takes scanned documents and translates them to speech or large print documents. This application does require the use of a scanner, but most university libraries offer access to scanners for students. Braille Sense: This devices was created for note-taking with a Braille keyboard, and has refreshable Braille dots for reading. Eye-Pal: This on-the-go scanner instantly converts printed materials to speech, text-files, or Braille. Talking Checkbook: This application helps students monitor and manage their funds or banking through an audio platform.